Last time, the FF took a trip to the moon, where they encountered the Red Ghost, his Super-Apes, and the Watcher. This issue begins with them returning from space to be greeted by an enormous crowd of spectators and well-wishers, far beyond their normal fans. It's yet another reminder of just how big of a deal the space race was at the time; despite all the fantastic things these four have done, Stan and Jack knew that having their characters achieve something the US was actually determined to accomplish would cement them in their readers' hearts, and make their world seem that much more real and believable - yes, even amidst Super-Apes. And lest the reader think the characters themselves unaware of how important this achievement was, the first thing Reed does upon getting home is write up the new rocket fuel which made the flight possible, and send his notes to NASA. about Sue's supposed uselessness? Really? It's issue #14, and it comes out not just in February, but in the week of February 14th as well. So it's no surprise, or at least an enjoyable coincidence, that love rules this story. After they've recovered from their trip to the moon, Reed chances to come upon Sue pining for Namor as she scans the seven seas for some sign of him; in a rare moment of emotional crisis for Reed, he wonders how useful his intellect really is if it can't help him win the woman he loves. By the same token, Sue is caught in the same indecision that's trapped her since they first met the Sub-Mariner: her heart still devoted to Reed, but unable to deny what she feels for Namor as well. 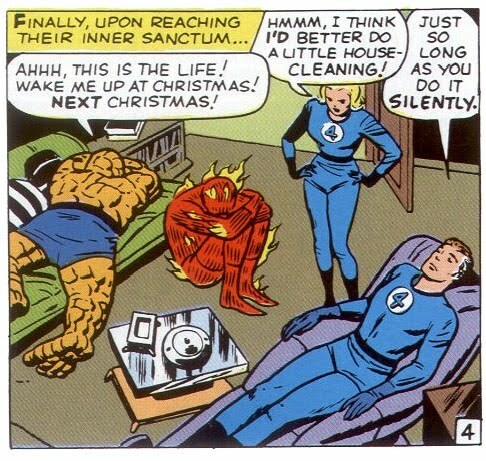 And when Subby breaks free of the mind-control he'd been under at the end of the story, the implication is because he was told to destroy the four, including Sue - and that's something his mind could simply not accept. Mr. Fantastic versus the foe called Love! 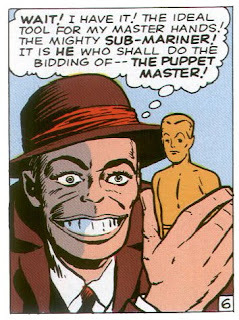 Fortunately, there's still enough room for all the Goofy Silver Age Writing we've come to expect. And, as with his last FF appearance, most of it has to do with the strange powers of the Sub-Mariner and the sea. This time out we meet: The Mento-Fish! Capable of transmitting a person's thoughts anywhere in the world through "mental electro waves!" The Hypno-Fish! Able to instantly hypnotize someone with its one enormous, gaping eye, then carry them in a huge, mobile air bubble! Sharp, dangerous dagger-needle coral! A fungus that quickly spreads over and engulfs any living creature! A giant undersea scavenger clam! A giant undersea porcupine! And yet, there are also signs of apology for past crimes against logic as well. In Johnny's solo outing against Namor, just last month, we were slack-jawed to see him flying around under the ocean, his flame both staying alive and providing air for Johnny to breathe. This time out he tries the same trick, but it's made clear that this is something he can only do for a very short time - just a few seconds, really - and it utterly, dangerously exhausts him. It's almost as if Stan read that last tale by Larry Lieber and decided that, of all Lieber's excesses and logical lunacies, that really was just a step too far. With this issue, the Sub-Mariner passes Doctor Doom for the number of appearances in the book, having been the baddie four times in these first fourteen issues (and once in Strange Tales), as opposed to Doom's three. And just as he shared billing with Doom in his second outing, here he's conscripted against his will by the terrible powers of the Puppet-Master, who somehow survived his last encounter with the FF. 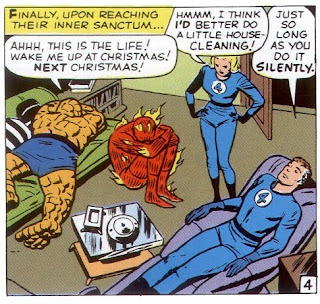 This provides a perfunctory excuse for the rest of the FF to bring along Alicia - the Thing's girlfriend and stepdaughter of the Puppet Master - as they go to rescue the Invisible Girl, kidnapped by the mind-controlled Namor. Even if it does seem a tad ludicrous for them to bring a blind, nonpowered woman on a dangerous, undersea mission against a known super-villain. And yet she ends up saving the day, of course, when she somehow senses the sinister, controlling presence of her (miles-away) step-father. Y'know. As blind people do. he finds his people, he's totally gonna calm down. Or something.